Sable Fur Blanket "Bargusin sable"
Feel the highest quality furs available with our finest Bargusin sable fur blanket made from the best Russian Bargusin Sable pelts. 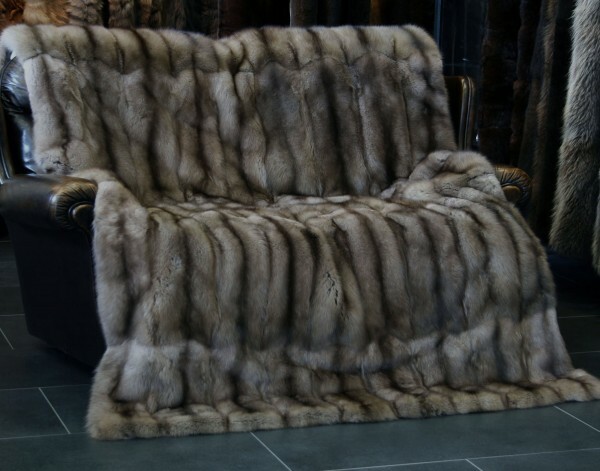 The furs we used for this sable fur blanket have the quality label Sojuzpushnina, which stands for very high-quality. This color of the sable fur blanket is natural and it is called "Tortora". The origin of the furs is from the Russia, and it is 100% wild fur and not farmed. We chose to manufacture this fur blanket with a matching, cashmere back lining to maintain this incredible quality. The dressing for this fur blanket is made by the renowned Italian M.I.B. Manifattura to enhance the luxury of this product even more. As always, we gladly manufacture this blanket in your desired size. Related links to "Sable Fur Blanket - Russian Bargusin Sable"
Customer reviews for "Sable Fur Blanket - Russian Bargusin Sable"
I love my purchase. It looks luxurious, feel luxurious, it has that high end look. I had to have it This will keep me warm and comfortable during the winter evenings while sitting watching some of my favorite movies or reading.